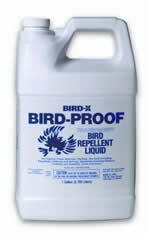 Repellent Gels & Repellent Liquids are bird prevention products that are designed to prevent birds perching or roosting. Repellent gel is normally used to prevent birds landing on solid external surfaces such as windowsills or architectural features and is applied using a mastic gun (caulking gun). Repellent liquid is a less viscous version of the same product allowing the user to spray or paint the liquid onto larger or more difficult to treat internal areas via a pressurised spraying device. There are numerous brands of both repellent gel and repellent liquid available on the market with most branded gel and liquid products having the same properties and being used and applied in the same way. Repellent gel is recommended for most types of external application and repellent liquids are more commonly used for internal applications. Both products are relatively easy to apply and virtually any surface where birds perch or roost can be treated with the product. 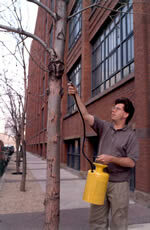 Even trees and shrubs can be sprayed with repellent liquid. 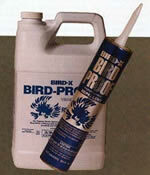 Both products are suitable for use with all species of birds making the products extremely versatile. Repellent gel and repellent liquid are both non-poisonous and non-harmful to birds according to the manufacturer, but both products can cause redness and irritation to human skin when contaminated and instructions for use of repellent liquid suggest that the product should not be sprayed directly on to birds. One supplier suggests that the product can irritate human eyes and eyelids can become glued together on contact. This clearly suggests that repellent gel can also glue the eyes of birds together. Repellent gel is a transparent sticky substance that feels tacky to touch and which will remain effective for periods ranging from 2 months up to one year. Repellent gel is designed to be effective in normal temperature ranges but will be less effective in temperatures below 0°C and above 40°C. Whilst gel is non-flammable, toxic gasses will form on combustion due to the petroleum content of the product. Repellent gel should always be coated with a sealant compound once installed to ensure that birds do not become ‘glued’ to the substance. It is a legal requirement in the UK to treat gel with a sealant. Repellent gel should only be used with caution on porous or semi-porous surfaces due to the fact that the substance will ‘leech’ into the stone, potentially causing staining. In extreme cases repellent gel can cause staining to masonry that will require the surface to be sand-blasted in order to remove the residue. A sealant compound is available to treat porous surfaces prior to application. Repellent gel is available in tubes which fit directly into a mastic gun for application. One tube of repellent gel will cover a 10 foot area when provided in a continuous bead. Installation instructions vary dependent on brand, but repellent gel is normally installed as one continuous strip leaving a minimum gap of 1” per 10 foot of product to allow rain to drain from the protected area. 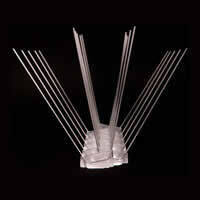 For standard installations on narrow surfaces (less than 4” wide) one ½” bead of product will suffice. For installations on wider surfaces (greater than 4” wide but less than 8” wide) a second bead will be required – the two beads should be spaced 2” apart. In both cases the bead nearest the leading edge of the area to be protected should be installed 1” from the leading edge. For surfaces greater than 8” wide multiple beads will be required. Once the repellent gel has been installed a sealant compound must be installed over the gel to ensure that birds cannot become trapped. Repellent liquid has a greater coverage than repellent gel and 1 gallon will cover an area of up to 125 square feet. Repellent liquid can be installed by painting on to the surface to be protected (once the surface has been thoroughly cleaned) or it can be sprayed via hand-pumped sprayers, mechanical sprayers or pressure generated sprayers. In the case of hand-pumped or mechanical sprayers a discharge pressure of up to 40-50 p.s.i. is acceptable. For equipment with a generated pressure a discharge pressure of up to 150 p.s.i. can be used. When repellent liquid is used to treat an internal area such as the struts and cross members of a steel-clad warehouse roof, the product should be sprayed in one continuous film over the areas to be protected. More than one application may be required where larger birds are concerned. One variation on the standard range of repellent gels is a product called ‘Hot Foot’. 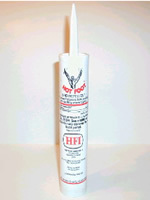 The bird prevention product is reputed to prevent birds landing by inducing a burning sensation or irritation in the feet of the bird. The manufacturer of the product suggests that this is not the case and that the gel operates in a conventional way by making the target species feel uncomfortable when landing on the product. The UK Government’s Licensing body for pest control products (DEFRA) confirms that the product is not licensed for use in the UK, although a majority of conventional Repellent Gels & Repellent Liquids are licensed for use in the UK. "It was one of the top priorities given to me," (Griffin's main building is metal with a trestle-type roof superstructure and many pipes and water lines) "It's very hot in Arizona, and the birds, especially pigeons, came inside to find shady spots. Pigeons sat on the rafters, roosted all night, and dropped all night. They messed up the entire area where people entered the administrative offices." “Before I was Maintenance Supervisor, someone else in the company had tried using high-frequency squawkers to prevent birds landing. The pigeons sat on them. I'm not sure that loud noises are so effective." "Then an ad for ‘Bird-Proof’ bird repeller in a chemical trade magazine caught my eye. This is probably the best way to do it I thought -- a permanent solution. So I ordered a case of 12 cartridges. That was more than a year ago, and we've had no pigeon problems since." "You don't need much. We just applied it on the pipes and everywhere the problem pigeons roosted. 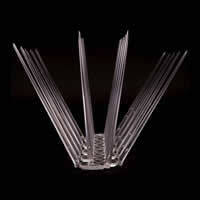 We used a lift truck with a man cage." "We put the gel on and waited. In two or three days, the pigeons were walking around with balls of feathers and debris on their feet. They looked funny. The sticky stuff did the job. The pigeons didn't bother us anymore. It was 100 percent effective as a deterrent. There were no ill effects from ‘Bird-Proof’, it was just sticky and made roosting uncomfortable for the pigeons." Repellent Gels & Repellent Liquids appear to have numerous applications, both internal and external, as well as being effective for use with a vast majority of pest species of birds. The product is simple and quick to install and installation can be carried out by the property owner rather than requiring the services of a specialist contractor. User feedback is very positive and although the product is clearly used extensively in the USA it is not as widely available in the UK. The profile provided by manufacturers and distributors suggest that this product is hard to beat as an all-round anti-perching device. There are a number of problems inherent with the use of both repellent gel and repellent liquid, particularly in the UK where strict legislation exists in respect of how the product is installed. There is a legal requirement for anyone that uses or installs the product in the UK to treat repellent gel with a protective coating that is designed to ensure that any bird that lands on the product will not become trapped or coated in the product. Applying the protective coating is not only time consuming but also adds to the cost of the installation and many pest control contractors fail to treat the gel for these reasons. As a result any bird that lands on the gel is at risk of becoming stuck in the gel, particularly if the product has been installed in an overnight roosting area where the target species will be stationary for 8-10 hours. The most common problem associated with untreated gel is that birds will land on the product, find that they are unable to move their legs and then start to flap their wings in an effort to free themselves. The wings then become coated in the product and when the bird eventually frees itself and attempts to fly it will plunge to the ground unable to use its wings. Repellent gel can also glue the eyes of birds together (as it can in humans) and therefore the product has the potential to cause serious injury or death to the target species and any other species that lands on the gel. Even if the product has been installed by a bona fide pest control contractor the legal responsibility for applying untreated gel will lie with the property owner, not the contractor. If a protected species such as a peregrine falcon dies or becomes injured as a result of coming into contact with untreated gel large fines and even imprisonment can result. At the time of researching this product only two leading UK suppliers of repellent gel and liquid (Huck Nets and Network) provided confirmation on their website that there is a legal requirement to treat gel products with a sealant compound. Another problem inherent with the use of gel as an anti-perching device is the speed at which the product will degrade and become ineffective. In some cases manufacturers and distributors suggest that the lifespan of the product may be as short as 2-months, in others up to a year. Whatever the case, the lifespan cannot be considered to be anything but extremely short relative to industry standard anti-perching products such as the anti-roosting spike. If the product is provided in a dusty or dry area, where the gel becomes coated with dust or sand, the product can be rendered ineffective almost immediately following installation. Any bird exclusion product or anti-perching product that is provided at height, where access is not only difficult but also expensive, must be able to stand the test of time. In most cases, where bird controls are required at height, the cost of access to areas where birds are nesting or perching can actually cost more than the product itself. Therefore, if a product has an effective lifespan of between 2 and 12 months, it cannot be considered to be cost-effective irrespective of where it is installed. Both repellent gel and repellent liquid are extremely expensive to buy relative to conventional anti-perching products. One tube of gel costing £7.99 will only cover an area of 10 feet when provided in a continuous bead, with the product requiring re-installation every 2- 12 months. 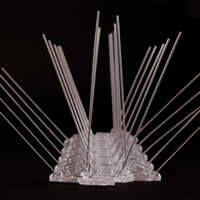 An equivalent meterage of anti-roosting spikes would cost in the region of £12.60 and the product would not only be significantly more effective as an anti-perching device but would not require replacement for a minimum of 12 to 30 years. Repellent liquid appears to have a greater coverage than repellent gel (up to 125 square feet) but distributors suggest that the product may need re-coating for some of the most commonly controlled birds such as pigeons and gulls. If re-application is required overall coverage from a 3.78 litre (1 gallon) container will be reduced from 125 square feet to 63 square feet. When the cost of a 3.78 litre container (£34.99) is taken into consideration, and the fact that the product may need to be replaced as regularly as every 2-months, repellent liquid is no more cost effective than repellent gel. Another significant disadvantage of both repellent gel and repellent liquid is that the product may damage the surface upon which it is provided. Gels are renowned for seeping into porous stone and leaving a residual stain which is difficult to remove without using invasive techniques such as sand-blasting. Although there is a primer available to treat stone to ensure that seepage does not take place few contractors ever use it, in the same way that sealant is rarely provided on newly installed gel. Repellent Gels & Repellent Liquids are simply not cost effective anti-perching product relative to other products on the market. Both products are expensive to buy, require a sealant compound which adds to the cost, have the potential to trap or harm birds, can damage the surface upon which they are installed and require replacement anywhere between 2 and 12 months following installation. Although manufacturers and distributors claim that the product is not harmful to birds or humans, the product clearly has the potential to cause skin and eye irritation to humans (including gluing eyelids together on contact) and if the product is not sealed it can also be potentially fatal to birds.